Now JJWhispers - bar and nightclub. 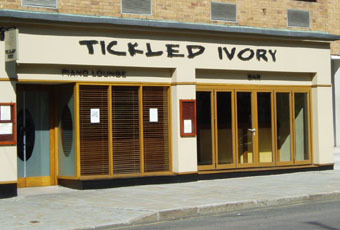 Tickled Ivory is now in Guildford, aim for Harpers then walk along the road towards the police station and the courts, it is sort of opposite lion's den. To be honest though, it is a tad pretentious, the music is good but the drinks are over-priced, �3.70 a pint!! If this place is in Guildford, why the Reigate address/map and all ? Is H File on a trip ? Init. Location, location, location! This bar has now relocated to Guildford, appealing to the non student brigade with an over 21�s entry policy. My girlfriend and I came here last Friday night (12 Sept) around 9ish and we were greeted by burly bouncers requesting ID from us. I�m mentioning this because one of them grew quite inpatient with me as I didn�t rapidly produce anything given my girlfriend had my passport in her bag! Inside, the place was fairly busy and I was served reasonably quickly at the bar by an efficient member of staff. A Gaymers and Red Bull came to �6.20 � a tad pricey - so make what you want from that if anything about the prices of drinks in here! The crowd was predominately men and it was evident this was generally an older gathering of people, certainly aged 30 and upwards. The atmosphere was tranquil and there was not a pretentious feel about the place. There was a bit of talent around, but being with the missus I was not searching for H-Files, but if I was, this is a place for �older� H-File victims. The d�cor is fairly stylish in my view and there are several seating areas as well as a couple of sofas near the piano and relatively small dance floor. Between the bloke playing the piano, there was funky house playing as background music. Yet, the plethora of �cheese� songs sung by the bloke playing the piano gave the impression Tickled Ivory was simply like a Flares bar but with an air of sophistication and without any students.